Dr Sridhar Maddela & Dr Pooja Maddela are a dynamic husband and wife team who are experts in the field of Yoga, Ayurveda, Eastern Naturopathy and the Medical Sciences. Both are currently pursuing PhD degrees, they have dedicated their lives to the healing path of yoga and natural medicine. Dr Pooja Maddela is a registered medical practitioner from the Department of Indian Systems of Medicine. She is the founding director of ‘Dr Pooja’s Yoga & Integrated Mind-Body Therapies’, offering integrative therapies including Yoga Alliance registered Prenatal Yoga Teacher Training. Pooja is an exceedingly skilled master yoga teacher/mentor, yoga therapist, yoga teacher trainer and clinician. She runs a busy clinical practice with an emphasis on Yoga therapy, Ayurveda and Eastern naturopathy. She worked for many years as assistant head of faculty and senior tutor at Wellpark College of Natural Therapies. 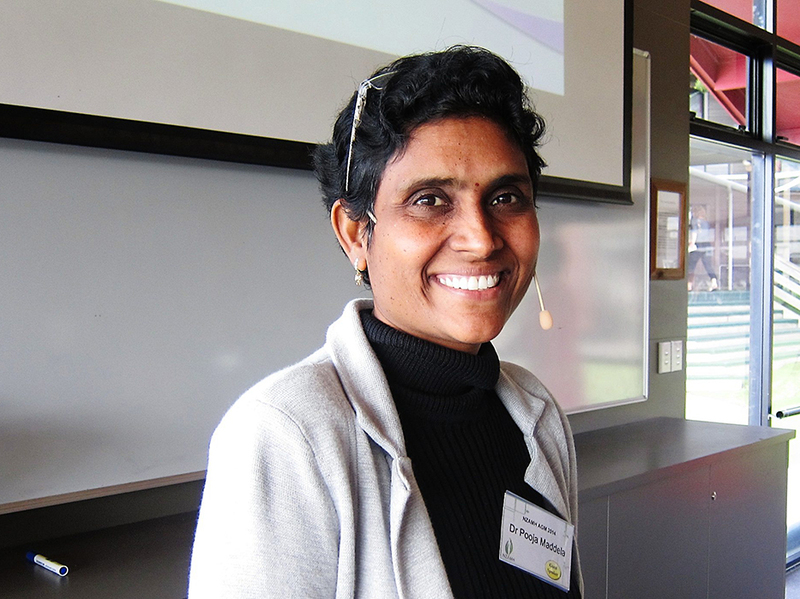 Pooja is well known for her unique quality of applying philosophy into practice. Her expertise in sculpting the mind and the body through the traditional practice of Natural therapies has transformed numerous students in their personal journey and academic and professional development. Pooja has also initiated and been actively involved with many community health programmes in Yoga with the Ministry of Health and Ministry of Education. Pooja sees her role as promoting the Indian Traditional art of Yoga and Naturopathy to the Western world. Pooja teaches group classes, workshops and courses as well as running a busy clinical practice specialising in the therapeutic applications of Yoga, Ayurveda, and Naturopathy. She has many years of experience successfully managing a wide range of health disorders such as muscular-skeletal problems, arthritis, obesity, depression, asthma, hypertension and many other chronic health conditions. She also specialises in women’s healthcare including hormonal imbalances and pre- and post-natal management. PhD Candidate, MHSc (Uni of Auckland), B Nat & Yogic Sci, PG Dip Yoga & Nat, Dip Physio. Dr Sridhar Maddela has an amazing ability to translate his profound understanding of Eastern wisdom and scientific medical understanding into potent clinical strategies. He firmly believes that health is achieved by changing the perception of the environment by practicing the principles of Yoga. Sridhar received in-depth training for many years in the fields of medical sciences, yoga therapy and Eastern naturopathy. For over 10 years Sridhar has held various senior and head of faculty positions in both the Medical Sciences and Yoga Faculties at Wellpark College of Natural Therapies (Auckland). Sridhar’s deep and profound understanding of the physical and energetic systems in the body offers practitioners tools to discover the causative factors of disease. His work explores beyond the physical manifestations of disease into the mysteries of the inner mind and offers a deep understanding of the human condition with a greater holistic perspective. Sridhar’s ability to integrate orthodox and Yogic philosophies, make him a unique teacher and lecturer. Raised in an orthodox medical family, Sridhar developed an in depth understanding of modern medicine through his upbringing and studies – yet he discovered a profound interest in holistic methods of healing. He earned a degree in Naturopathic and Yoga from NTR University of Health Sciences, A.P. India; a post graduate Diploma in Yoga and Naturopathy from Gujarat Ayurved University, Jamnagar and a Diploma in Physiotherapy. He also holds a Masters in Health Sciences from the University of Auckland. He started his career as a medical officer and lecturer at various institutes in India and his research on asthma was presented at international seminars. He was a guide for various research activities. His research titled ‘Psyche of Parkinson’s Disease: A Yoga Perspective’ has gained international recognition and he has established correlations between mind-body associations. 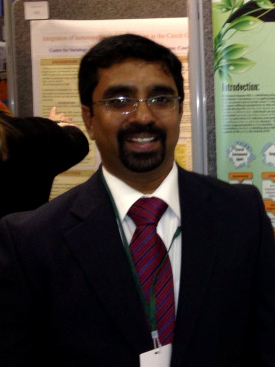 Sridhar is a peer reviewer for Light on Ayurveda Journal. He is instrumental in developing yoga and yoga therapy qualifications. You can connect with Pooja or Sridhar through their local community yoga classes and workshops. 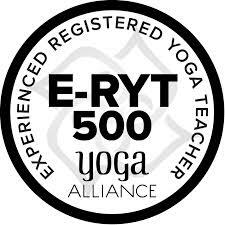 They also offer teacher trainings to yoga instructors who want to deepen their practice and instructing. If you would like to experience integrative therapies in a clinical setting, you can arrange to have a session with either Pooja or Sridhar one-on-one where you will learn beneficial practices that suit your unique physiology, and be offered lifestyle guidance for healthy living. Please contact us to make an appointment.